On Monday, Apple updated its system status webpage with an announcement saying customers would be unable to access the online Apple from 3 a.m. to 8:30 a.m. Eastern due to a scheduled maintenance downtime. As noted, Apple usually issues press releases at around that time, stoking speculation that a new product will see release once the store returns to service. While an official announcement has yet to be made, recent rumors suggest the company is planning to launch a series of new iPads in the near future. At the forefront of those rumors is a 128-gigabyte iPhone SE, a device that is due for an upgrade but might not rate the usual media event treatment. Apple launched the original SE last March, meaning a minor specification bump could be in the cards. More recent rumblings suggest Apple is looking to launch new iPads including a hotly anticipated 10.5-inch iPad Pro model with a thin-bezel display and overall footprint just slightly larger than the current 9.7-inch iPad Pro. Uprated iPad Pros are also slated for release, including a revamped 12.9-inch iPad Pro and a 9.7-inch variant, the latter of which might replace iPad Air 2 as Apple's student and enterprise tablet. New iPad Pro models are less likely to debut tomorrow, as Apple traditionally holds public events for such high-profile launches. While the company might add a low-cost 9.7-inch iPad and upgrade iPhone SE to its online store with little fanfare, a newly designed 10.5-inch model is unlikely to see release without a media presentation. 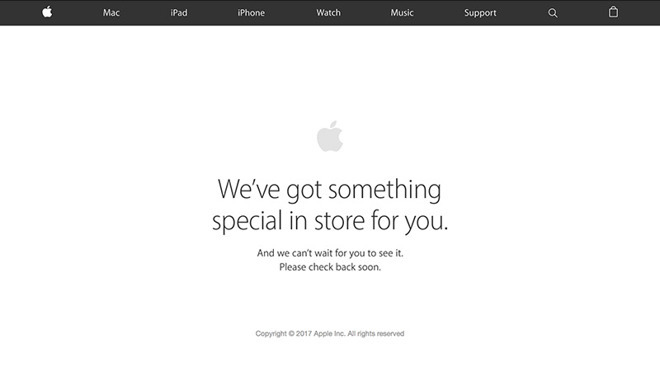 Apple's online store is expected to return to operation at 8:30 a.m. Eastern, 5:30 a.m. Pacific.